The updated catalog also offers a wide variety of products to ensure your business is protected and prepared for electrical hazards such as arc flash. Creative Safety Supply, Oregon’s premier retailer of industrial safety and lean manufacturing products, is happy to announce the latest release of its extensive catalog. 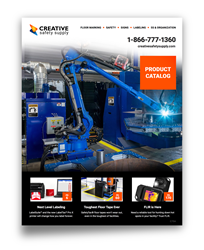 The newest edition of the catalog is packed to the brim with safety and efficiency solutions that will improve the way industrial, construction, and manufacturing businesses operate. CSS’s catalog is a great resource for companies and safety managers looking to implement Lean logistics, or make their facilities’ safety programs robust and their production floors and warehouses more organized and efficient. This catalog contains floor marking products like SafetyTac® Floor Tape, the toughest floor marking product out there. Its resilient material holds up against traffic and spills, and its reinforced rubber-based adhesive was designed for strength and longevity. Floor marking helps visually communicate walking lanes, storage areas, and much more. The newest version of the catalog includes our extended library of wall and floor signs designed to help improve visual communication in any facility. Signs are made with high-quality, industrial-strength material, so they’ll be able to handle extreme, high-stress environments. Signs are designed with bright, easy-to-read fonts in order to catch people’s attention, and these signs are available with OSHA-compliant headings, signal words, and symbols. Visual communication products like the Wet Floor Caution Signs in English/Spanish allow workers to communicate slipping hazards in a bright, mobile format, and its bilingual factor means it can convey its message to a larger audience. The updated catalog also offers a wide variety of products to ensure your business is protected and prepared for electrical hazards such as arc flash. Since working in energized environments come with a number of dangers, it’s important to implement strong electrical safety practices. This catalog includes an extensive safety section that addresses the issues facilities need to address to keep workers protected and accident-free. Products like Lockout/Tagout stations, tags, and systems help reduce the risk of injury during maintenance and repairs, and Arc Flash Calculation Software helps facilities calculate arc flash boundaries and hazard risk category per NEC/CEC and OSHA requirements. For those interested in learning more about electrical safety, the catalog also provides links to Creative Safety Supply’s Resource Center, which contains a number of helpful guides and articles that provide important information about 5S, Kaizen, wire color codes, and much more. Creative Safety Supply is an Oregon-based supplier and manufacturer of safety and lean manufacturing products to help businesses solve their workplace safety and productivity challenges. The company’s LabelTac® industrial label printers, SafetyTac® floor marking tape and other visual marking tools make it easier for safety managers, facility managers and businesses owners to make their workplaces simple to navigate.